The U.S.-Mexico border in Nogales in 1898 and pre-2011. International Street/Calle Internacional runs through the center of the image between Nogales, Sonora (left), and Nogales, Arizona (right). Note border posts without fence and rail line in 1898. Customs Post where the first shooting occurred is in center of image this side of rail line. Click on image to enlarge. The Battle of Ambos Nogales (The Battle of Both Nogales), or as it is known in Mexico La batalla del 27 de agosto (The Battle of 27 August), was an engagement fought on 27 August 1918 between Mexican military and civilian militia forces and elements of U.S. Army troops of the 35th Infantry Regiment, who were reinforced by the Buffalo Soldiers of the 10th Cavalry Regiment, and commanded by Lt. Col. Frederick J. Herman. The American soldiers and militia forces were stationed in Nogales, Arizona, and the Mexican soldiers and armed Mexican militia were in Nogales, Sonora. This battle was notable for being a significant confrontation between U.S. and Mexican forces during the Border War, which took place in the context of the Mexican Revolution and the First World War. Prior to the late 1910s, the international border between the two Nogaleses was a wide-open boulevard named International Street, but during the course of the decade the violence associated with the Mexican Revolution and growing hysteria related to World War I brought stricter U.S. control of the border. Anti-foreign sentiment grew in the border region with the publicizing of the German Empire's Zimmermann telegram in February 1917. (Some U.S. military historians of the 10th Cavalry and 25th Infantry later claimed German military advisors encouraged with Mexican rebels under General Francisco "Pancho" Villa to fight against the U.S. in Nogales.) Related to the World War I anti-foreign sentiment, the shooting deaths of Mexican nationals at the border by U.S. soldiers in Nogales in early 1918 increased racial tensions in the two border towns. As a result of the August 27 battle, the U.S. and Mexico agreed to divide the two border communities with a chain-link border fence, the first of many permanent incarnations of the U.S.–Mexico border wall between the two cities along the two countries' border. 1.3 German espionage or national security hysteria in the borderlands? The outbreak of the Mexican Revolution in 1910 against the long-time rule of President Porfirio Díaz initiated a decade-long period of high-intensity military conflict along the U.S.–Mexico border, as different political/military factions in Mexico fought for power. The access to arms and customs duties from Mexican communities along the U.S.-Mexico border made towns such as Nogales, Sonora, important strategic assets. The capture of the key border city of Ciudad Juárez in 1911 by Mexican revolutionaries led by Francisco I. Madero (and his military commanders Francisco "Pancho" Villa and Pascual Orozco) led to the downfall of President Diaz and the elevation of Madero to President. The violent aftermath of Madero's assassination during a coup in 1913 again highlighted the importance of the U.S.-Mexico border, as battles for control of Mexican Nogales between Villistas and Carrancistas (forces of Gen. Venustiano Carranza, a former Villa ally) led to American involvement because of cross-border firing into the U.S.. This took place during the Battle of Nogales (1913) and again during the Battle of Nogales (1915). The inability of the various political factions in Mexico to reach consensus on fundamental political, social and economic reforms prevented the conclusion of the Mexican Revolution until a significant time after the 1918 Battle of Ambos Nogales. During the November 1915 Battle of Nogales fought between the forces of Francisco Villa and Carranza (led by Gen. Álvaro Obregón and Gen. Plutarco Elías Calles), one U.S. serviceman, Pvt. Stephen B. Little, was killed by a stray bullet as U.S. troops guarded the border in Nogales from the violence in Mexico. The carrancistas won the battle over Villa's forces despite three-way firing across the border. Carrancista forces had received diplomatic recognition from the U.S. government as the legitimate ruling force in Mexico. Villa, who had previously courted U.S. recognition, then attacked the American border community of Columbus, New Mexico. This led directly to further border tensions as U.S. President Woodrow Wilson unilaterally dispatched the Punitive Expedition, under Gen. John Pershing, into the state of Chihuahua to apprehend or kill Villa. Although the manhunt for Villa was unsuccessful, small-scale confrontations in the communities of Parral and Carrizal nearly brought about a war between Mexico and the U.S. in the summer of 1916. Additionally, National Guard units of various states were deployed to the U.S.-Mexico border—including Nogales, Arizona—to bolster border security as the Punitive Expedition continued its operations in Chihuahua. The militarization of the border region during this time has led to this period—which includes the Mexican Revolution, the Punitive Expedition and the U.S. entry into World War I—being termed the so-called Border War. Generals Álvaro Obregón, Pancho Villa and John J. Pershing (behind Pershing is Lt. George S. Patton). Despite its initial policy of neutrality, various factors such as unrestricted submarine warfare and the publication of the Zimmermann telegram caused the U.S. to declare war on Germany in April 1917, entering World War I on the side of the Allied powers. Besides the obvious concern with spill-over violence along the border, U.S. military leaders along the border carried out surveillance of German espionage activities. 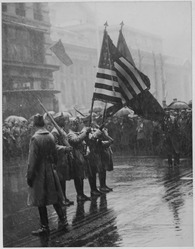 With the British interception of the Zimmermann telegram in 1917, the U.S. knew well of the German Empire's attempt to bring Mexico into the war on the side of the Central Powers. U.S. anxiety over Germany's overtures to Mexico notwithstanding, the war-weary Mexican nation was in a markedly disadvantaged position from which to engage in the sort of military reconquest of the U.S. Southwest (an area that had been Mexican national territory prior to the 1846–48 U.S.–Mexico War and its peace, the 1848 Treaty of Guadalupe Hidalgo) that was envisioned in the Zimmermann telegram. The seemingly interminable Mexican Revolution led to the devastation of the overall Mexican economy, causing food shortages throughout the nation (including northern Sonora) and a mass migration of Mexicans into the United States through ports of entry such as Nogales. Additionally, the 1916-17 Punitive Expedition vividly exposed the differences between the U.S. and Mexico in terms of logistics. Though recognized as the legitimate leader of the Mexican Republic, President Carranza did not control large swaths of territory—such as the regions held by Francisco Villa and Emiliano Zapata. Moreover, the U.S. use of motor vehicles and two airplanes during the Punitive Expedition stood in stark contrast to the conditions existing within the Mexican Federal Army and the various disparate militias, where weapons, bullets, uniforms and even food could often be in very short supply. American and Mexican soldiers guarding International Street in Ambos Nogales. The obelisk in the center is a border marker, which still stands. A Mexican border post is in the middle foreground of the image. The Americans had a similar one on their side. German espionage or national security hysteria in the borderlands? The tomb of Andrés Ceceña, a Mexican customs official killed during the 27 Aug. 1918 Battle of Ambos Nogales, is located in Heróica Nogales, Sonora's Panteón de los Héroes. 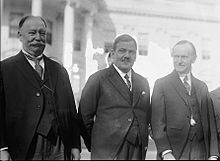 Supreme Court Justice (and former U.S. President) William Howard Taft, Mexican President Plutarco Elías Calles and U.S. President Calvin Coolidge at the White House, 1924: Although future-president Elías Calles' involvement in settling the Ambos Nogales dispute was small when compared to his later accomplishments, it was indicative of the Sonoran leader's growing stature in Mexican politics during the 1910s and '20s. Finally, Gen. Cabell's report recommended that a two-mile-long border fence be erected down the middle of International Street. That, Cabell wrote, “will do more [to] prevent friction than any other measure.” Gov. Calles acceded to Cabell's proposal. “In opinion [of] both officials,” the Nogales Herald reported, “[the] clash [of] August Twenty-Seventh and two previous clashes this year would have been averted had this fence been built.”  The raising of the first permanent border fence through the Ambos Nogales community is significant as it signaled the end of the previously open nature of the international border in this community. Although the Mexican Revolution and World War I, and their related tensions, faded by the early 1920s, the border security issue would remain a major concern culminating in the U.S. Immigration Act of 1924 and the establishment of the U.S. Border Patrol that year. Lots, Barney, Cp., G Co.
Whitworth, Frank, Cpl., H Co.
Hungerford, Capt., 10th Cavalry, Troop C - the 35th Regimental History page for this battle states Hungerford was shot through the heart and killed instantly. Quartermaster Sgt. Victor Arana, with the 35th Infantry, was wounded. Pvt. A. L. Whitworth, Co. G, 35th Infantry, was hit in the groin. A private (Co. F, 35th Infantry) was hit and fell across the street from the home of "Colonel" A. T. Bird. Lt. Col. Frederick J. Herman, Tenth Cavalry, the commander, suffered a slight but hampering leg wound. Capt. Henry C. Caron, Troop F, 10th Cavalry, was hit in the right arm below the elbow. Lavery, James Flavian, Quartermaster Pvt., 35th Infantry, earned a Distinguished Service Cross at the Battle of Nogales for "braving the heaviest fire, repeatedly entering the zone of fire with his motor truck and carrying wounded men to places of safety, thereby saving the lives of several soldiers." Fannin, Oliver, Lt., G Co., 35th Infantry, would win the Distinguished Service Cross "For valor and bravery . . . while under fire, carried a wounded man to safety in the Nogales battle." He was also the recipient of a testimonial prepared by 33 of the leading citizens of Nogales. This differs slightly from a list of the 35th Infantry Regiment who are listed as killed in action on 27 August 1918. It also cites one officer of the 10th as having been killed. Mexican casualties were reported later, by John Robert Carter of the 25th Infantry Regiment as being 125 (28-30 in Mexican Army uniforms) killed and 300 wounded. Found among the Mexican dead were allegedly two German agents. 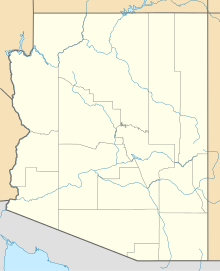 It is important to note, however, that neither Carter nor the 25th Infantry Regiment were in Nogales when the battle or its immediate aftermath occurred (the 25th Infantry replaced the 35th Infantry Regiment in Nogales). Evidence suggests some elements of the Mexican garrison in Nogales, Mexico, participated in the battle but local newspapers such as the Nogales Herald noted that the majority of the unit had left Nogales in the days before the battle to engage anti-government rebels led by revolutionist Juan Cabral near Sasabe. Monument to the Mexican participants of the Battle of Ambos Nogales located just south of the border on Calle Adolfo Lopez Mateos in Nogales, Sonora. A close up of the Battle of Ambos Nogales Memorial in Heroica Nogales, Sonora. "27 August 1918: Dedicated to the citizens who fell fulfilling their [patriotic] duties." Historical marker on Calle Ruiz Cortines in Heróica Nogales, Sonora, indicating the place where Felix Peñaloza died on 27 August 1918. The U.S. government's investigation into the Battle of Ambos Nogales indicated that the origins of the violence were found in the resentment Mexican nationals felt from the U.S. Customs officials' poor treatment and the sense of impunity that took place when the killers of Francisco Mercado and Gerardo Pesqueira went unpunished. Nevertheless, low-level rumors circulated of potential German involvement in this battle. Echoing the comments of some U.S. participants in the battle, James P. Finley wrote in Huachuca Illustrated "found among the Mexican dead were the bodies of two German agents provocateurs." No further corroborating evidence—such as a description of these individuals' particular persons, belongings or potential intelligence reconnaissance from Nogales residents—is presented by Finley or other authors who have written on the topic. Fred Herman, whose wartime rank of lieutenant colonel had been reverted to his regular army (i.e. peacetime) rank of captain, testified before a congressional committee headed by New Mexico Sen. Albert Fall that he believed that German agents led the Mexican combatants during the 27 August battle. 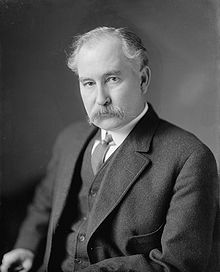 U.S. Sen. Albert Fall of New Mexico, angry over the 1917 Mexican Constitution's calls for the nationalization of the oil industry, Fall— with deep ties to the oil industry—sought to pressure the Mexican government from enacting such policies through coercive measures, such as threats of military intervention in Mexico. His congressional hearings in 1920 on border outrages included testimony from the former military commander in Nogales, Arizona, Fred Herman. On the Mexican side, the batalla del 27 de agosto is also an obscure topic, but less so. A Mexican corrido, "El Corrido de Nogales", was composed by participants of the battle, memorializing the Mexican interpretation of the events of that day. The municipal leaders in Nogales, Sonora, erected a monument near the international boundary commemorating the Mexican participants and victims of the battle, while the municipal government continues to maintain the tombs of Mayor Peñaloza, Andres Ceceña, Maria Esquivel, and other victims in the city's Panteón de los Hėroes. A monument dedicated to Gen. Plutarco Elias Calles, President of Mexico 1924-28 and a negotiator of peace between the U.S. and Mexico in Nogales in August 1918: This monument is located on Calle Elias Calles in Heroica Nogales, Sonora, south of the Plaza Hidalgo. ^ Parra, "Valientes Nogalenses," 16-17. ^ Finley, James P.; Reilly, Jeanne (1993). "Buffalo Soldiers at Huachuca: The Battle of Ambos Nogales" (PDF). BYU Library. Brigham Young University. Archived from the original on 1999. Retrieved 9 November 2016. Mexican casualties are not known, but found among the Mexican dead were the bodies of two German agents provocateurs. John Henry Nankivell (1927). Buffalo Soldier Regiment: History of the Twenty-fifth United States Infantry, 1869-1926. U of Nebraska Press. p. 145. ISBN 0-8032-8379-2. Parra, Carlos Francisco (24 August 2018). "Battle of Ambos Nogales signaled birth of border fence". Nogales International. ^ DeRosey C. Cabell, “Report on Recent Trouble at Nogales, 1 September 1918,” Battle of Nogales 1918, Pimeria Alta Historical Society (Nogales, AZ). See also DeRosey Cabell, “Memorandum for the Adjutant General: Subject: Copy of Records to be Furnished to the Secretary of the Treasury. 30 September 1918,” PAHS. ^ “May Close Border, Halt Food Runners,” Nogales Herald, 22 June 1918. E.M. Lawton, U.S. consul in Nogales, Sonora, noted that wealthier Mexicans did not suffer the sort of deprivations that “the lower class of the people” felt during this difficult period of sacrifices for the U.S. war effort. Food shortages were common in Mexico during the Revolution. DeRosey C. Cabell, “Report on Recent Trouble at Nogales, 1 September 1918,” Battle of Nogales 1918, Pimería Alta Historical Society (PAHS), Nogales; Parra, Carlos F., "Valientes Nogalenses: The 1918 Battle Between the U.S. and Mexico That Transformed Ambos Nogales", Journal of Arizona History, Vol. 51 (Spring 2010), 8-9. ^ Tinker Salas, Miguel, In the Shadow of the Eagles: Sonora and the Transformation of the Border During the Porfiriato (Berkeley: University of California Press, 1997), 171; Parra, "Valientes Nogalenses," 8-11. ^ Tinker Salas, 171; “Local News,” The Border Vidette (Nogales, AZ), 3 August 1918. ^ DeRosey Cabell to Commanding General, Fort Sam Houston, Texas, 30 August 1918, Battle of Nogales 1918, PAHS; “Local News,” The Border Vidette, 5 January 1918; “Mexican Shot by Sentry,” Nogales Daily Herald, 13 December 1917. According to witness Frank Arcadia, Mercado was playing with his dog when he crossed the international boundary and came upon the U.S. guard. Frank Arcadia interview, n.d., transcript, PAHS. “Local News,” The Border Vidette, 5 January 1918; “Anticipated Trouble Was Mostly Rumors,” Nogales Daily Herald, 1 January 1918; DeRosey C. Cabell, “Report on Recent Trouble at Nogales, 1 September 1918,” Battle of Nogales 1918, PAHS. See also, “Memorandum for the Adjutant General: Subject: Copy of Records to be Furnished to the Secretary of the Treasury. 30 September 1918,” ibid. ; Parra, "Valientes Nogalenses," 10. ^ Alberto Rojas Peña, “Gesta Heróica del 27 de Agosto de 1918” (H. Nogales, Sonora, México: Archivo Histórico Municipal); Miguel Noriega interview, n.d., transcript, PAHS; Tinker Salas, In the Shadow of the Eagles, pp. 171-72. “Record of Investigation held at Nogales, Arizona, 28, 29 and 30 August 1918, in regard to conflict in Nogales, Ariz., 27 August 1918,” Battle of Nogales 1918, PAHS. See also Cabell to Commanding General, Fort Sam Houston, Texas, 30 August 1918, Battle of Nogales 1918, PAHS; José Garza Zertuche to Cabell, 2 September 1918,” Battle of Nogales 1918, PAHS; Parra, "Valientes Nogalenses," 8-11. ^ James P. Finely (1993). "Buffalo Soldiers at Huachuca: The Battle of Ambos Nogales". Huachuca Illustrated A Magazine of the Fort Huachuca Museum. BYU.edu. Retrieved 6 January 2013. Note: Finely quotes: Glass, Edward L.N., History of the Tenth Cavalry, 1866-1921, Old Army Press, 1921,83. ^ Carlos Francisco Parra (2010). "Valientes Nogalenses: The 1918 Battle Between the U.S. and Mexico that Transformed Ambos Nogales". Journal of Arizona History 51 (Spring 2010): 1–32. See pages 20-22 for this section. Journal of Arizona History, arizonahistoricalsociety.org. Retrieved 6 January 2013. Note: Parra's 2010 article conflicts with many details and interpretations previously documented in military reports and unit histories. ^ “Second Battle of Nogales,” The Border Vidette, 31 August 1918; Alberto Suárez Barnett, Mi Historia . . . Nuestra Historia: 1884-1918-2007 (H. Nogales, Sonora: Imagen Digital del Noroeste, 2007), p. 12; Miguel Noriega, “Memories of 1918 Battle at Nogales,” in Oscar J. Martínez, ed., Fragments of the Mexican Revolution: Personal Accounts from the Border (Albuquerque: University of New Mexico Press, 1983), p. 198; Pablo Lechuga Bórquez, “Por que la H se antepone al nombre de Nogales, Sonora, México: Batalla del 27 de agosto de 1918” (H. Nogales, Sonora: Archivo Historico Municipal, 2000), p. 1; Rojas Peña, “Gesta Heróica,” p. 2; Flores García, Nogales, Un Siglo en la Historia, 55. See also Elliot Steams, “Battle of Ambos Nogales,” Sombrero, (May 1990), p.15. ^ Flores García, Nogales, Un Siglo en la Historia, p. 55; Suárez Barnett, Mi Historia, p.12; Rojas Peña, “Gesta Heróica,” p. 2. ^ Parra, "Valientes Nogalenses," 12-14. ^ Noriega, “Memories,” p. 198; Cabell, “Report on Recent Trouble at Nogales, 1 September 1918,” Battle of Nogales 1918, PAHS. ^ a b "The 35th Infantry Regiment at Nogales, Arizona". 35th Infantry Regiment Association. cacti35th.org/. 1999. Retrieved 18 January 2010. ^ Parra, "Valientes Nogalenses," 14. ^ “Sidelights of Battle,” Nogales Herald, 30 August 1918; “Colonel Herman is Pleased with Help of Nogales People,” ibid., 7 September 1918; Clarence C. Clenenden, Blood on the Border: The United States Army and the Mexican Irregulars (London: Macmillan Company, 1969), p. 347; Lechuga Bórquez, “Por que la H se antepone al nombre de Nogales, Sonora, México,” p. 1; Flores García, Nogales, Un Siglo en la Historia, 57. ^ Flores García, Silvia Raquel Nogales, Un Siglo en la Historia (Hermosillo, Sonora, Mexico: INAH-SEP, Centro Regional del Noroeste, 1987), 55; Antonio Avitia Hernández, Corrido Histórico Mexicano. Vol. 3: Voy a cantarles la historia, 1916-1924 (México, D.F. : Editorial Porrúa, 1998). ^ Parra, "Valientes Nogalenses," 16. ^ Finley, James P. “Buffalo Soldiers at Huachuca: The Battle of Ambos Nogales.” Huachuca Illustrated, vol. 2 (1996); Rojas Peña, “Gesta Heróica,” p. 2; Noriega interview, PAHS. Allyn Watkins interview, Arizona Historical Society (Tucson, AZ). ^ Rojas Peña, “Gesta Heróica,” p. 2; Lawton, “Records,” pp. 195-96; Suárez Barnett, Mi Historia, p. 12; Parra, "Valientes Nogalenses," 14-16. ^ Parra, "Valientes Nogalenses," 18. ^ Parra, "Valientes Nogalenses," 18-19. ^ Parra, "Valientes Nogalenses," 20-21. ^ Parra, "Valientes Nogalenses," 20. ^ “Military Commanders Hold Final Conference Sunday,” Nogales Evening Daily Herald, 2 September 1918; Arreola, “La Cerca y Las Garitas de Ambos Nogales,” pp. 504-541. ^ "The 35th Infantry Regiment Honored Dead by Last Name (1918 KIA)". 35th Infantry Regiment Association. cacti35th.org/. 1999. Retrieved 18 January 2010. ^ Parra, "Valientes Nogalenses," 21. ^ Parra, Carlos (24 August 2018). "Battle of Ambos Nogales signaled birth of border fence". Nogales International. ^ “Says Carranzistas Led Nogales Fight,” New York Times, 12 February 1920; Fall, Albert Bacon. Investigation of Mexican Affairs, (Washington, D.C.: Government Printing Office, 1920), p. 1813. ^ Trow, Clifford W., “Woodrow Wilson and the Mexican Interventionist Movement of 1919,” Journal of American History, vol. 58 (June 1971), pp. 46-72.; Clenenden, Blood on the Border; Glass, History of the Tenth Cavalry, p. 84; and Eppinga, Jane, Nogales: Life and Times on the Frontier (Chicago: Arcadia Publishing, 2002). ^ a b Parra, "Valientes Nogalenses," 26. ^ Parra, "Valientes Nogalenses," 23-24. Katz, Friedrich. The Secret War in Mexico: Europe, the United States, and the Mexican Revolution. Chicago: University of Chicago Press, 1984. Tinker Salas, Miguel. In the Shadow of the Eagles: Sonora and the Transformation of the Border During the Porfiriato. Berkeley, CA: University of California Press, 1997.